Stress incontinence is well recognised as being more prevalent in people with cystic fibrosis than in the general population. If you’ve already read our article on the benefits for exercise for cystic fibrosis you may be familiar with some of the reasons why. But, despite being a very common problem for men and women with CF, this topic, unsurprisingly, is not one that is openly discussed. Sadly, that can mean that the ways to improve the problem also aren’t shared widely and great techniques remain far too secret. This is where ‘The Knack’ comes in. So simple, but so life-changing. Why might your pelvic floor muscles need exercise? The pelvic floor muscles literally line the bottom of the pelvis to support our pelvic organs. Pelvic floor muscles are exactly like all other muscles in the body in that they fatigue when they are used too much, or become weak when they are not exercised enough. For people with CF, risk factors associated with incontinence are imbalance of the muscles of respiration, posture and continence, as well as increased intra-abdominal pressure associated with persistent cough or an increased incidence of constipation. As you may have guessed though, the most commonly reported cause of incontinence, for people with CF in particular, is coughing and other forced expiratory manoeuvres. At times when your cough is worse or you are feeling more breathless, you may find that your pelvic floor control seems to worsen. It makes sense that this would make you reluctant to perform airway clearance techniques, lung function tests and to exercise, even if it’s the time that you should be doing the most. Frustrating, isn’t it? But there is good news. Just like any other muscle in the body, if you exercise your pelvic floor muscles by challenging them to do repeat contractions, they thicken and strengthen, becoming firm and toned again. These muscles respond quickly and effectively to exercise and research has shown that focused slow and quick contractions 3 times a day will show improvement in just 12 weeks. If you would like more detailed instruction and text reminders to your pelvic floor exercises, download the excellent Squeezy CF app. If you are ready to progress from the simple focused exercises, try my Pilates for your pelvic floor video here on Pactster. We work on using the pelvic floor muscles while doing progressively more complex arm and leg movements. Pilates incorporates the other really important core muscles, the transverse abdominus and the diaphragm in breath control too. 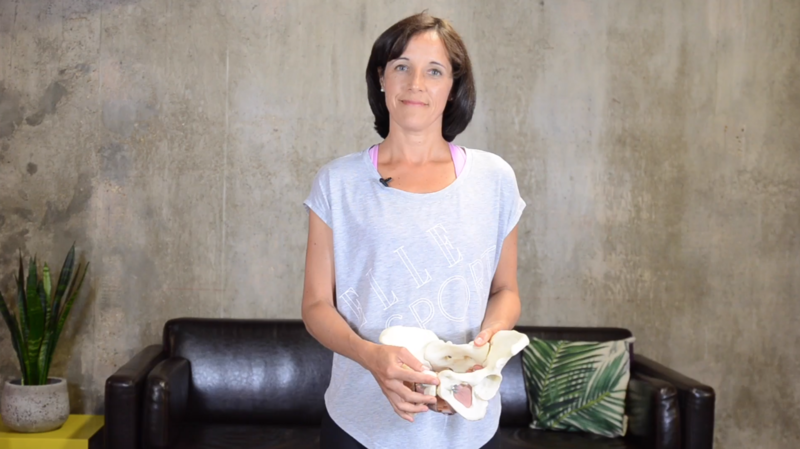 You might also like this short ‘Pelvic Floor and Core’ workout from Zelda and Leah. The Knack is really quite simple. The Knack is the magical art of consciously drawing up your pelvic floor muscles just before you cough, sneeze, laugh or pick up something heavy. If you are a visual person, like me, perhaps this analogy will help you. Like a brand new trampette straight out of the box, we should have a firm, springy, toned set of muscles. But with overstrain, deconditioning and fatigue it can end up feeling like a rather tired and overused; a sense that if you jump too hard your feet might touch the floor! All is not lost if you use The Knack to create supportive tension. If you tighten your pelvic floor muscles, in the exact moment before you cough, they create a strong firm surface for the cough to ‘bounce’ off, keeping the pressure away from your bladder and also helping to close around the opening of the bladder tube. I admit that The Knack is not the most ‘natural’, it’s not ideal - it requires thinking - but it can make the difference between whether you experience an annoying leak or not. It’s a simple concept; a bit tricky to master but then super effective! Practice the Knack with a ‘pretend’ cough after you have been to the toilet and have an empty bladder. With your bladder empty so you are unlikely to come unstuck. Challenge the system gently. Hold your pelvic floor muscles firmly and then cough lightly. After a few days of practice, when that is feeling safe and secure, challenge the skill by coughing a bit harder. Then increase your confidence by allowing an hour to pass so that your bladder is fuller when you cough (but start with the lighter coughs again!). You should also try to practice 3 or 4 “pretend” coughs in a row as people rarely cough just once. With practice you will train a ‘learned-reflex’: a habit. Your brain gets so used to the sequence of prepare, protect, cough that you do it on auto-pilot. The Knack alone might not be enough for you. Your pelvic floor muscles could be so weak that you need help to get them working effectively. It is also possible to have muscles that have become too tight from the constant demand of supporting you when coughing. If they are constantly overworking they can become easily fatigued or sore and painful. That can be really miserable, affecting your exercise choices, sitting and your love life, too. Did you know that there are gadgets and devices to help re-train a pelvic floor? And specialist physiotherapists too! You will be familiar with specialist respiratory physiotherapists, but myself and colleagues have post-graduate training that allows us to offer individual assessment, training and support for all pelvic, obstetric and gynaecological problems for men, women and children (our professional organisation is www.pogp.org.uk). Don’t hesitate to ask your GP or respiratory team to refer you to a pelvic health physiotherapist. In many parts of the UK, you can even self-refer. Do share this wonderful secret with your friends. And if you have any questions at all about bladder, bowel, pain or other pelvic issues I am very happy to help. *Clarification and confirmation of the Knack maneuver: the effect of volitional pelvic floor muscle contraction to preempt expected stress incontinence. Miller, J.M., Sampselle, C., Ashton-Miller, J. et al. Int Urogynecol J (2008) 19: 773. doi:10.1007/s00192-007-0525-3). Other information in this article is based on the 'Standards of Care and Good Clinical Practice for the Physiotherapy Management of Cystic Fibrosis' published by the Cystic Fibrosis Trust.